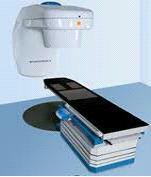 Three-dimensional conformal radiation therapy (3DCRT) is a technique where the tumour is mapped with imaging equipment and then treated with multiple beams of radiation. Proton beam radiation therapy, similar to 3D conformal radiation therapy, this technique uses protons, instead of x-rays, to kill the tumour. Protons are parts of atoms that can pass through healthy tissues with little damage, and destroy tumour cells at the end of their path. As a result, proton beam therapy may be able to deliver more radiation to the tumour while not affecting healthy tissue near the cancer. Intensity-modulated radiation therapy (IMRT) is a treatment method in which the intensity of the radiation can be changed during treatment. In conventional therapy, intensity is set for the entire treatment session. Figure : planning simulation used by a radiation oncologist. 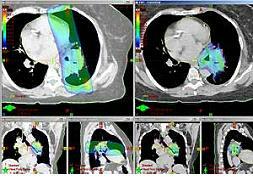 Left images show larger dose via 3D conformal radiation therapy; right images show smaller dose with IMRT. 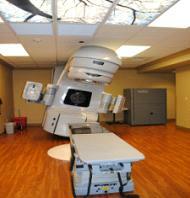 External radiation therapy is an outpatient procedure. External radiation treatment may require an investment of time — a course can involve daily sessions over several weeks. Common side effects of external beam radiation therapy include irritation of the treated region and fatigue.